If I’d had any idea how good this book is, I would have read it much earlier. I have never come across a better introduction to Buddhism, one that is neither too esoteric nor too simplistic. The author aims to present the core teachings, independent of custom, convention and eastern cultural trappings. Some of his conclusions may seem surprising. For instance, he clearly states that practicing Buddhism as a religion is fine, but it isn’t essential, because the Buddha’s central teaching is simply the importance of exploring the mind, including thought, sensation, and emotion, for that is where our suffering happens and where we experience it. Dzogchen Ponlop’s experience as an easterner transplanted to the west makes him uniquely qualified to speak of this eastern tradition transplanted to the same soil. When instructors at Columbia University asked him to introduce himself, he was at a loss. Born of Tibetan parents in exile in India, and emigrating to New York City, he wasn’t sure who or what he was. 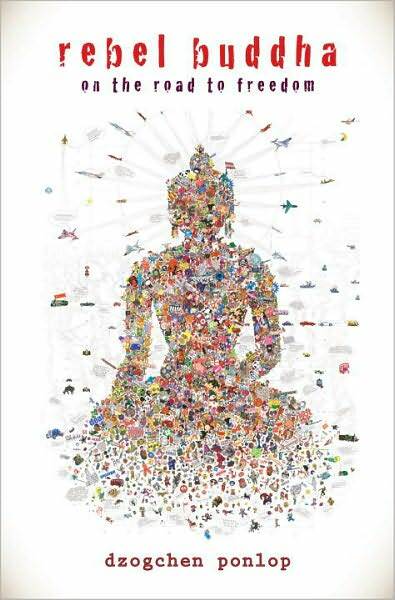 Ponlop’s title, Rebel Buddha very naturally references the historical Prince Siddhartha, who abandoned all the privileges and responsibilities of a crown prince in his search for spiritual truth. The title also calls to the indestructible potential for true freedom in each of us. The rebel buddha within is that unconditioned awareness, “a trouble-maker of heroic proportions,” that will accept nothing less for us than the freedom that all the historical Buddhas discovered. The actual word, “buddha,” does not refer to a few people only, but means, “awakened,” and is part of our own nature. Even the willingness to investigate whether this is true can be enough to set our feet on the path. There’s a lot of that in this book of Dzogchen Ponlop, a spiritual master who writes as a fellow traveller on the road. This entry was posted in Buddhism and tagged book reviews, Buddhism. Bookmark the permalink.